It always amazes me how a company the size of Google can maintain an internal culture that is consistent yet unique to each one of its offices. Having grown up on the East Coast and then having gone to school and worked on the West Coast, I've experienced the culture changes that come with living in those different geographic areas. Native residents of course will always wear their respective cultures as a badge of honor, and I consider that to be a good thing. Be it active or subconsciously, these local traits and characteristics will always mange to manifest themselves in a number of visible ways. For example, going out of one's way to recycle in my hometown of Buffalo, NY would earn someone the title of an oddball. And, composting? Ha! Hand me that Styrofoam cup so that I can drink my Tim Hortons in peace. Now that I'm living in Berkeley, CA, I've found just the oposite to be true. Styrofoam is a dirty word. In fact, its mere presence would likely be enough to cause a tremendous commotion at one of the cafes near my house. If a meal is not local, fair-trade, and organic, then it's probably not worth eating. And may god have pity on the poor soul who decides to throw his banana peel in the trash as opposed to the compost bin. The reason I'm talking about culture to begin with is that I am working from Google's Seattle offices in Fremont this week as opposed to their campus in Mountain View. The office here is much smaller, and happens to be a stone throw away from my former college campus at the University of Washington. Despite the office here being pretty small, and despite the fact that I am working in a completely different part of the country, the culture in Seattle is remarkably similar to what I might expect to find of a Google office in California. While there certainly isn't the same hustle and bustle of activity as one might find in the controlled chaos that I've come to know as Mountain View (MTV), the Seattle office is an incredibly cool place to work. The fact that the office is smaller lends itself nicely to the fact that people generally seem more personable toward one another. Although the Googlers in MTV are incredibly nice, on a campus that size you absolutely lose a sense of the close knit personality that is gained by working with a smaller number of coworkers. Although I'm not exactly sure the of root cause of the coziness I feel working in the Seattle office, a part of that must absolutely have to do with the city's weather. Although it may be cold, gray, and wet outside, the Google office here is warm and inviting. An abundance of couches, collaborative nooks, and very open floor plans makes the entire place feel closer to a dorm than an office. 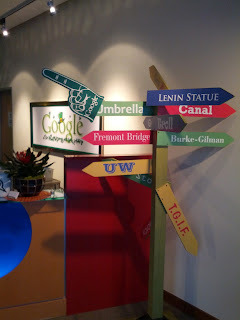 Regardless of which Google office I visit (I've been to four now! ), I am always pleasantly surprised to see no shortage of dogs roaming around. While my friends were visiting for lunch today, we met a very friendly rescue dog named Duke in the lobby. He was a 7 year old black-lab, and his owner was just as friendly as he was! Even in the New York City office, dogs seemingly had the run of the place. I believe coming into work is all that much nicer because Google employees have the freedom to bring with them the animals they care so much about. I've come to depend on the fact that Googlers in general are warm, inviting, intelligent, and hard-working no matter where they may live or what their job title may be. The more Googlers I meet and have a chance to interact with, the more proud I am to count myself among them. Posted by Patrick Dugan on February 29, 2012 .